JOURNEY was built brand new by her owners and she is the first hull of the Ocean Alexander 72' series to have the new Evan Marshall hardtop and exterior window design. This model is unique because there is a separate entrance and a separated full beam master stateroom from the guest staterooms, giving theowners complete privacy from the other guests. She isloaded withoptionsand every available space for storage was utilized. JOURNEY'S upgrades include: extended warranties on the engines until 2020, second generator, teak on the Flybridge under hard top, crew quarters with separate shower and head, boat deck awning, A/C on Flybridge, and wireless cell phone monitoring of ships systems and movement. JOURNEY has spent the last couple of Summers in the North East and Winters in Fort Lauderdale. She has just completed the 1000 hour service on the engines in May 2018, and sheis in turn-key condition and ready for her new owners to go Summer boating. The original owners are moving up to their next Ocean Alexander and are ready to sell! United Yacht Sales New Jersey would love to guide you through a personal showing of this 72' Ocean Alexander 72 Pilot House 2016. 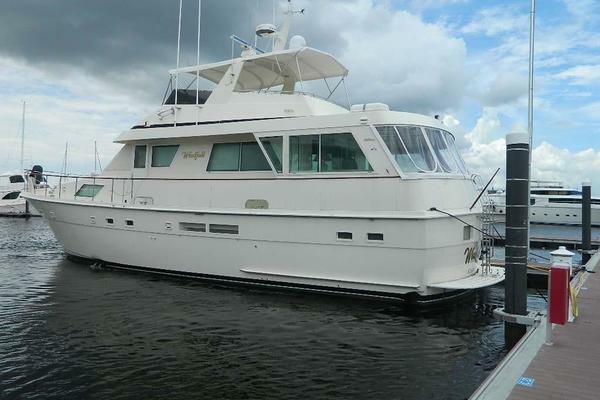 This yacht for sale is located in Ft. Lauderdale, Florida and priced at $2,895,000. For a showing please contact us by filling out the form on this page and we will get back to you shortly! Enlarged windows in salon with custom engineered solution incorporation marine grade aluminum beams allowing for industry leading window expanse. Evan Marshall designed interior pilot station and display pod. With matching wood/Ultraleather and “floating” display pod. Ergonomically designed and laid out to enhance pilot experience/performance. Vinylester resin with marine grade structural foam. High-density allows for high temperature resistivity and particular advantage in thermal and acoustic insulation. EXCLUSIONS All personal property is excluded unless specifically identified and included in the sale agreement and listing specifications. Personal property refers to all items not permanently attached to the vessel including but not limited to: artwork, furnishings, and recreational or entertainment items. Advertisements, marketing materials, and/or other photography may depict the vessel with personal property, however, such personal property is excluded unless otherwise specifically included as provided herein.